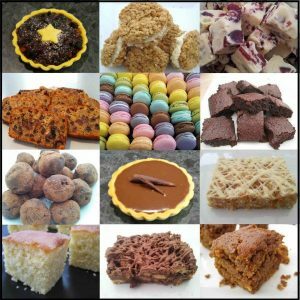 Below is a selection of our Christmas foodie offerings this year, and the good news is most of our Tasty Bakes can be gift wrapped. We’re taking orders up until 5pm Monday 17th December, and collection is from our Willunga kitchen between 8 and 12 noon on Christmas Eve. Please use the Contact Us button to place your order. A mixed gift box of 13 generous servings of delicious treats freshly prepared for your festive pleasure. Perfect for a bit of everything to tempt your tastebuds, just $65! The treats are packaged into a 12″ gift box and comes wrapped in cellophane with festive ribbons, so you could choose this as a gift for someone! (NB. picture for illustrative purposes only, some items may differ, contents will include an assortment of festive fudge, tarts, cookies, macarons, brownies, lemon cake, tiffin, christmas slice, etc etc, etc). 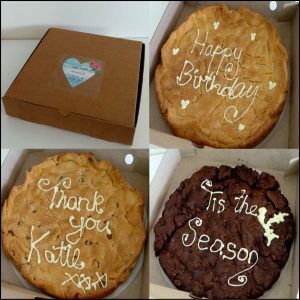 These 10″ 500g delicious personalised cookies are available to order in the following flavours for just $15. These HUGE cookies are offered at an introductory price, and come in a cool pizza-style box. You can write whatever you want in your message. Available in other shapes and flavours on request. Minimum order of 25, starting price $1 each. 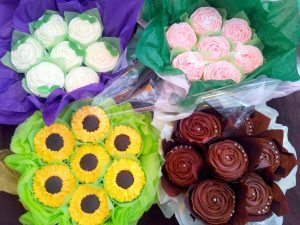 These gorgeous boucakes are a bouquet… made out of cakes! Your choice of flower/colour scheme, these make a great alternative to actual flowers. Prices start at $35, they come giftwrapped with cellophane and co-ordinating ribbons. 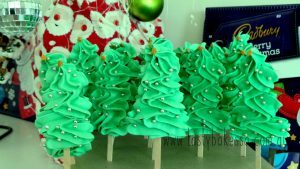 These very special Christmas cupcakes are lovingly made to order. Prices start from $8 each and there is a minimum order of 6. 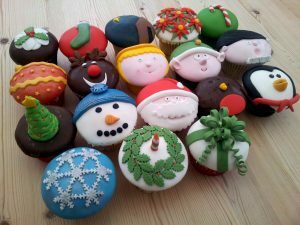 If you want non-Christmas themed cupcakes, we would love to accommodate.